STEAM - Science, Technology, Engineering, Art, Maths. Designed for young 21st century ladies, STEAM Powered Girls attract girls to scientific and technical learning through attractive colourful activities. Watch and play with the fascinating science of primary colour. It can be a beautiful zoetrope and mood light too! 6 templates with lovely patterns. Watch it dance in the dark. Animation zoetrope. The lamp is 15cm in height when assembled. Contents: 1 x base, 1 x lamp body, 1 x lamp shade, 1 x zoetrope, 6 x animation strips, 6 x disk templates, 1 x axis, 1 x battery compartment cover, 1 x screw and detailed instructions. Also required but not included in this ki: a small crosshead screwdriver and two 1.5V AAA batteries. Age 8 + years. 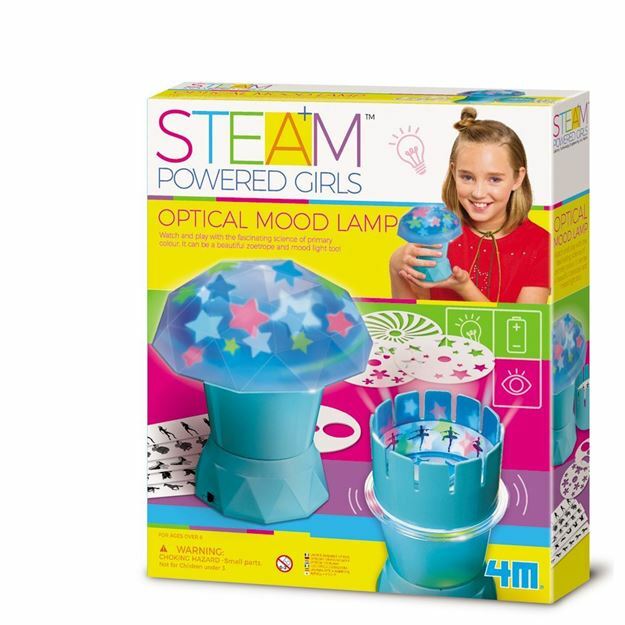 Part of the STEAM Powered Girls range. Distributed in New Zealand by Holdson.